Throughout 2017 Saxquest will be featuring a different St. Louis based Saxophonist every month. We are starting the year off with local saxophonist and educator Jason Swagler. 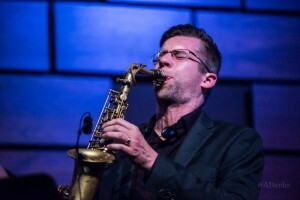 Jason is the director of the Jazz Studies department at Southern Illinois University Edwardsville(SIUE), where he has been a faculty member since 2000. Jason is also an instructor through the Jazz St. Louis program JazzU, that rehearses and performs at Jazz at the Bistro. Aside from teaching Jason gigs on a regular basis. He is one of the top call saxophonists in St. Louis. We have assembled a fantastic rhythm section to accompany Jason for his performance as well. Jason will be joined by Adam Manness on Piano, Bob Deboo on Bass, and Kaleb Kirby on Drums.